Orthopedic nursing (more formally referred to as orthopaedic nursing) is that nursing specialty which focuses on the prevention and treatment of a wide range of diseases, disorders, and injuries of the musculoskeletal system which consists of the bones, muscles, ligaments and tendons throughout our bodies. Orthopedic nurses provide care to those suffering from problems such as arthritis, sprains, bone fractures, muscular dystrophy, osteoporosis, fibromyalgia, and genetic abnormalities and deformations. Orthopedic nurses are responsible for assessing, diagnosing, and treating patients with musculoskeletal issues. These nurses are trained in a variety of specialized skills such neurovascular status monitoring, traction, casting, and continuous passive motion therapy. 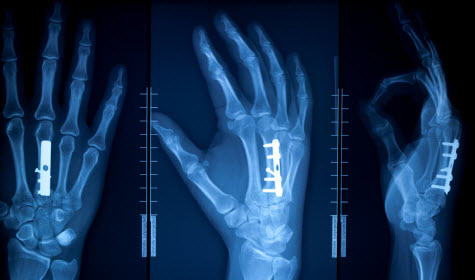 They are often responsible for taking x-rays, setting and casting fractures and broken bones, administering medication, educating patients on taking medications properly, educating patients on managing pain without medication, and educating patients on exercises to increase mobility and expand their range of motion. If surgery is required then orthopedic nurses will often assist during surgery as well as provide post-operative care. The primary role in orthopedic nursing is the advancement of musculoskeletal heath care through research, education, and nursing practice. Nurses in the field hold a variety of positions in the health care field including staff nurses, nurses in all levels of hospital and private practice management, RN first assistants in surgery, case managers, nurse educators, and researchers. They can also work as advanced practice nurses as a clinical nurse specialist or nurse practitioner. Orthopedic nurses work in a variety of settings. They often work in hospitals settings such as in emergency departments, operating rooms, trauma units, various orthopedic and medical-surgical units (pediatric and adult), etc. They also work for private physicians with outpatient practices, clinics, nursing homes and rehabilitation facilities, home health care agencies, and in academic environments like colleges and universities offering nursing degrees. To become an orthopedic nurse, one must first become a registered nurse. This entails earning a nursing diploma, an Associate’s degree in nursing, or a Bachelor’s degree in nursing. Alternatively, you can complete a direct entry Master’s program in nursing if you hold a Bachelor’s degree in a non-nursing discipline. Once a nursing diploma or degree program has been completed, you must pass the National Council Licensure Examination for Registered Nurses (NCLEX-RN). The Orthopaedic Nurses Certification Board (ONCB) offers an orthopedic certification examination. However, applicants need to have at least two years of experience as an RN including at least 1,000 hours of experience in orthopedics. Those who pass the examination earn the credential Orthopaedic Nurse Certified (ONC). Advanced practice nurses who are nurse practitioners and clinical nurse specialists specializing in orthopedics can earn the credentials Orthopaedic Nurse Practitioner Certified (ONP-C) and Orthopaedic Clinical Nurse Specialist Certified (OCNS-C), respectively.